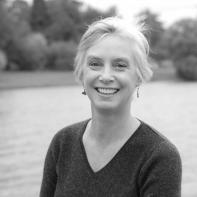 Joannie Stangeland's new book, Into the Rumored Spring, was published last fall by Ravenna Press, and she's the author of two poetry chapbooks- Weathered Steps and A Steady Longing for Flight, which won the Floating Bridge Press chapbook award. Joannie's poems have appeared in The Midwest Quarterly, Valparaiso Poetry Review, Tulane Review, Fire On Her Tongue, and other publications. Joannie's taught writing at Richard Hugo House and LiTFUSE, and she's the poetry editor for the online journal The Smoking Poet. mathematics hollowed on the beach. in a hand, the years' rooms memory-thick.